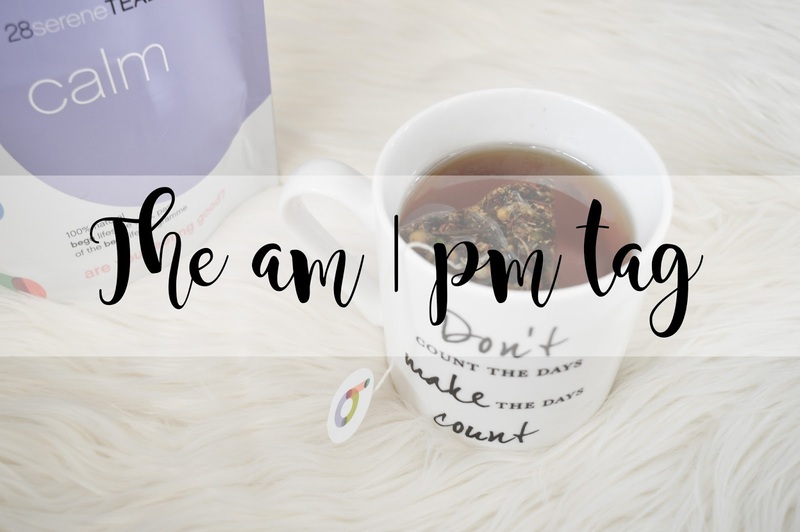 Recently I have seen the AM/PM Tag floating around my bloglovin feed and I couldn't help but get involved! I absolutely love tags and they are in my top five of favourite posts to write up! I never really used to have a routine when I was in school and college, especially when it came to a beauty a routine; I didn't care but as I have grown older, I've realised I need to take care of my skin, especially now my eczema is getting a lot worse than what it ever used to be. Routines are a part of my life and I would be a right mess if I didn't have one! Every Morning I wash my face using Clean & Clear and I then moisturise with No7 Beautiful Skin day cream. Easy Peasy! For breakfast I'd either go for granola and milk or granola, yoghurt and fruit. Sometimes a bagel if I fancy something quick and easy. I will always be a black coffee kind of girl! However, I am currently enjoying Begu tea first thing in the morning. How long does it take to get out of the door? It depends where I'm going and how long I wanted to sit down, drinking my coffee while scrolling through social media. If I don't do this, it can take me 40 minutes. If I do sit down and have my coffee, give me an hour to an hour and a half. What's your go-to makeup look on a fuss-free morning? If I'm not doing anything throughout the day and I'm sat at home, I won't wear any makeup. However, if I'm just popping into town or to the supermarket I'll wear concealer, powder and some mascara! What's your evening beauty routine? I take off my makeup using which ever product I feel like picking up on the day! I have so many different makeup removers (I might actually do a post on this). I then use the boots Cucumber Face Mask if I feel like it or I'll go straight to the Heaven Skincare cleanser and then I finish off my beauty routine by moisturising using No 7 Beautiful Skin Night Cream and also their eye cream. Chocolate, of some sort. Always chocolate! I am currently enjoying M&M's. I cosy up in bed with a hot chocolate, a lit candle and my book! A perfect way to end any day! Pyjamas and fluffy socks (if my feet are cold). Now the nights are getting colder, I'll most likely be wearing my batman fluffy pyjamas or I'll be wearing my cosy flannel pyjamas from Primark. What are some things you have to do before hitting the hay? Prepare what I'm going to wear for the next day (if I'm going out), prepare my unviersity or work bag (If its Tuesday, Wednesday or Thurday evening). I also have to watch some sort of youtube video, whether I completely catch up with all my favourite youtubers or only watch a couple of videos; I have to do this every night. Let me know if you do this tag so I can check out your answers! You can also receive 10% off over on Itsy Nails! Love this! I'll have to do this for a blog post at some point!